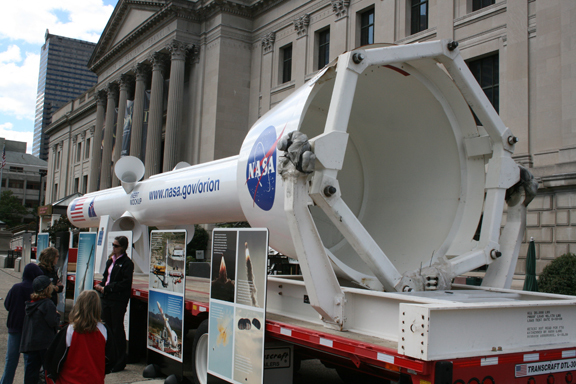 Ken Kremer: A full scale mock-up of the Orion Launch Abort System (LAS) is hitting the road for a cross country trek of several museums and science centers. 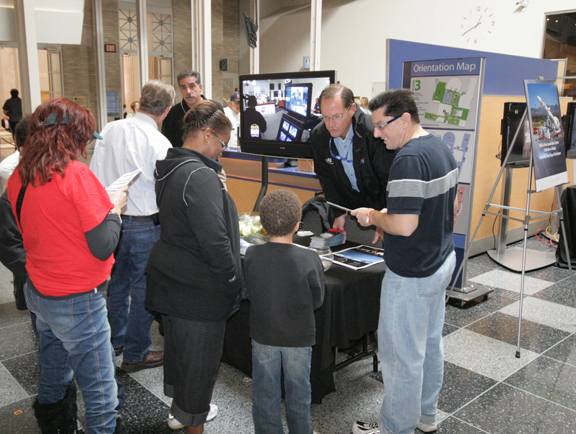 The public can see the LAS spacecraft hardware up close and personal and learn about the Orion crew vehicle and abort system. I visited the LAS in Philadelphia, PA where it was on display at the Franklin Institute Science Museum during the weekend of October 16 and 17, 2010. 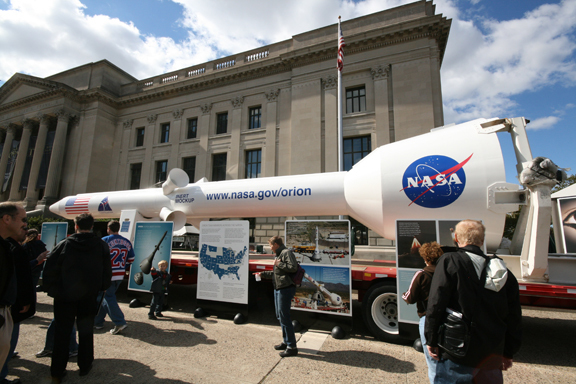 It is a rather startling and rare sight to behold the 45 foot long rocket assembly mock up sitting pretty on a long flatbed tractor trailer outside the steps of the architecturally grand museum in the midst of the bustle of a major American city with cars driving by. 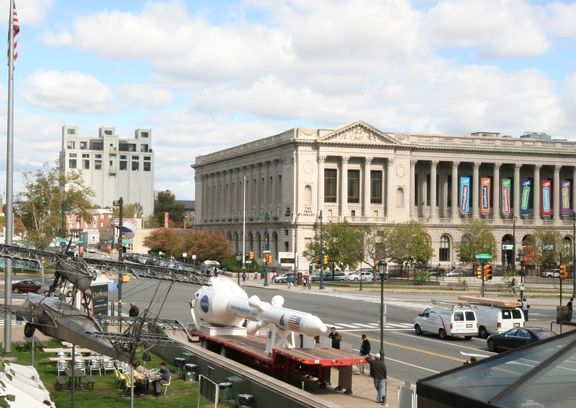 The spacecraft hardware was far too large to bring inside the museum. 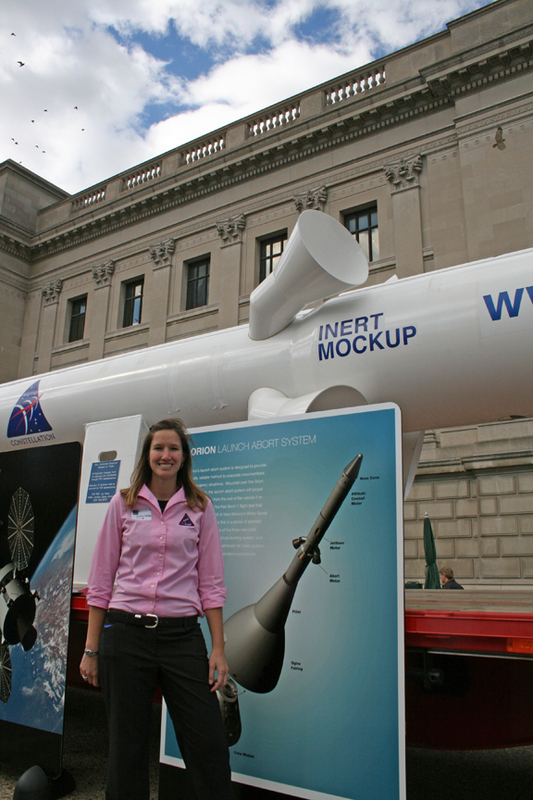 The impressive rocket display and information panels were popular with kids and adults passing by. 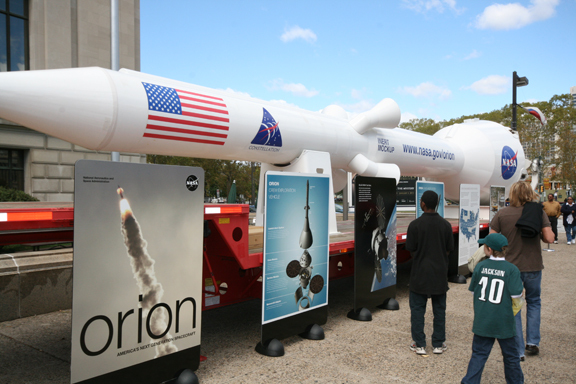 The outdoor display was accompanied by an exhibition booth inside the museum atrium which was manned by engineers from Orion prime contractor Lockheed Martin and subcontractor ATK to explain Orion spacecraft operations. Orion is NASA's next generation manned spacecraft and is designed to eventually replace the Space Shuttle. The shuttle will be retired sometime in 2011. The first Orion orbital test flight - dubbed OFT-1 - is set for 2013. The LAS is designed to immediately pull the Orion crew module away from the launch vehicle during an emergency on the pad or during the climb to orbit and saves astronauts lives. 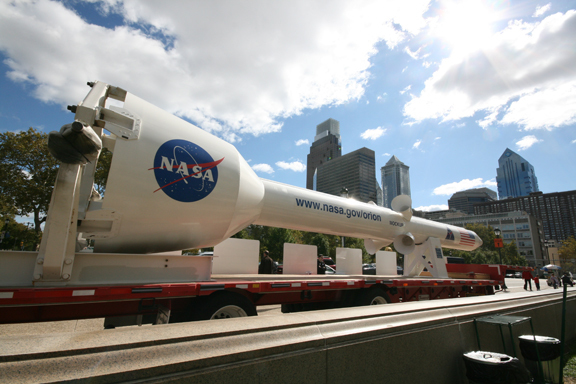 Known as the LAS pathfinder, the mock up is traveling the roadways from the U.S. Army's White Sands Missile Range in New Mexico to NASA's Kennedy Space Center (KSC) in Florida. At KSC, it will undergo future pathfinding operations for investigation with the Orion crew exploration vehicle to prepare for the OFT-1 flight. Between New Mexico and Florida, the LAS is making several public stops. The next stop is in Hampton, Va on October 23 for the 2010 EarthFest at Sandy Bottom Nature Park near the NASA Langley Research Center. Stops on the tour so far include the Denver Museum of Nature & Science, Denver; Orion High School, Orion, Ill; Adler Planetarium, Chicago and Great Lakes Science Center, Cleveland. "This LAS pathfinder was used by ground crews to practice lifting and stacking operations at the launch pad to help prepare for handling the actual flight hardware used in the flawless Pad Abort 1 (PA-1) test flight," Heather McKay told me. McKay is a propulsion engineer for Lockheed Martin in Denver. "The LAS is the highest thrust and fastest acceleration abort system ever tested. This is the only abort system of its kind in the world and its state of the art. It is equipped with three types of solid rocket motors. The innovative abort system will significantly improve astronaut safety for future human space flight." The PA-1 test took place on May 6, 2010 at the U.S. Army's White Sands Missile Range near Las Cruces, N.M. During the test, the system fired the abort motor thrusting the crew module mock-up off the pad, reaching a speed of about 445 mph in three seconds. NASA Langley has led the development of the LAS in partnership with the NASA Marshall Space Flight Center in Huntsville, Ala.
Read my earlier Orion reports: 'Plymouth Rock' Human Asteroid Trek Proposed for 2019, "NASA's Pioneer Orion Capsule Starts Its Test Phase", "Orion Budget is Cut 20 Per Cent with 600 Jobs Eliminated and Progress Slowed", and "NASA's First Lunar Orion Test Capsule Built"